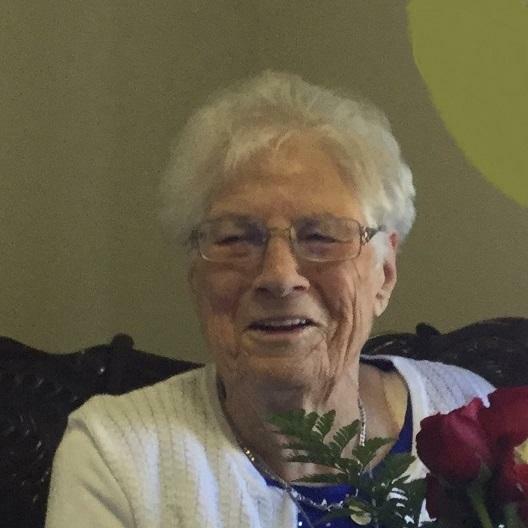 Passed peacefully away the Burin Peninsula Health Care Centre in Burin, NL, on Sunday, Feb. 25th, 2018, MARTHA MADELINE SMITH of Brookside, NL, in her 98th year. Leaving to mourn her loving son Angus (Ann), Boat Harbour, daughters Mary, Georgia, USA, Lola Rice (Leo), Mount Pearl, Edna Gillingham (John), Paradise, Helen Myers (John), Cambridge, ON, Martha Nichol, Mount Pearl, Lisa Bunce (Dennis), California, USA; 17 grandchildren, 26 great-grandchildren and 11 great-great grandchildren; sister Rita Allen, Marystown, sisters in law Ivy Brushett, Jacques Fountaine, Mary Brushett, Grand Bank; special friend Lucy Greene, Mount Pearl; and a large circle of relatives and friends. Martha is predeceased by her husband George, daughter Lillian Churchill and sons in law Bill Churchill and Frank Stien, and several brothers and sisters. Rev. Renee Easton conducted the funeral service at the Church of the Ascension, Brookside, on Thursday, March 01st, 2018 at 2:00 pm. Interment was at the Anglican Church Cemetery in Brookside, NL. Donations in Martha’s memory may be made to the Church of the Ascension, Brookside, NL. Pall bearers were Craig Churchill, Trevor Churchill, Trent Churchill, Lanny Smith, Dwayne Gillingham, and B J Farrell.